TORTURED ARTIST: a review of "Inside Llewyn Davis"
If the Coen brothers set out to do what I think they did, then their latest film is simply ingenious. "Inside Llewyn Davis," the 16th film from the inimitable fraternal Writing/Directing team of Joel and Ethan Coen, is yet another high achievement in a career, which aside from a couple of rare exceptions, contains nothing but high achievements. It is a challenging, prickly, haunting, darkly humorous and often bleak film that is as idiosyncratic and as singular as any of their previous works yet it also feels like the latest chapter in an ongoing Coen brothers' story. As always, the Coens defy whatever expectations one might have, in this case, towards a film about a folk singer and set during the folk music scene in early 1960s Greenwich Village, by playing their cards very closely to their chests, almost not revealing any sense of intent until near the film's conclusion. While this may have some of you scratching your heads, wondering throughout the viewing just what the point of this experience may be, just remain patient because I believe once it all becomes clear to you as it did for me, the effect will feel like a bolt of lightning. And perhaps, as I elucidate over "Inside Llewyn Davis," while I promise, as always, to not produce spoilers, my thoughts may inform the overall experience. So, if you prefer to view "Inside Llewyn Davis" completely uninformed, then feel free to save this review to read after you see the film. Dear readers, regardless of those previous words, do trust me on this one as I definitely would not steer you wrong. At this precarious time in cinema, where films have grown to be more homogeneous and the individual creative voice has become increasingly rare, we should all thank our lucky stars that we have Joel and Ethan Coen, filmmakers who have somehow marched valiantly, continuously, unapologetically, and unrepentantly to their own creative rhythms for 30 years and with "Inside Llewyn Davis," they have not only proven that they have no signs of running dry anytime soon, they have delivered one of my favorite films of 2013. Opening upon the image of a microphone in the smoky Gaslight Cafe nightclub circa 1961, "Inside Llewyn Davis" stars Oscar Isaac in the title role, a folk singer reeling from the suicide of his singing partner yet has decided to continue onwards as a solo act to limited success, if that. Essentially penniless and homeless, Llewyn Davis spends his days and nights trying to survive on his art on his own terms while also sleeping upon any couch he is able to find through his increasingly depleting circle of friends and acquaintances. The film traces roughly one week in his turbulent life as Llewyn is faced with the weak sales and non-existent financial results of his debut solo album. He is also forced to confront folk singing competition, most notably from the singing duo of Jim and Jean (played by Justin Timberlake and Carey Mulligan), and additionally endures Jean's intense rage with being possibly impregnated by him plus her demands that he pay for an abortion. And even on top of that, Llewyn Davis is hurled through a series of escalating transgressions, tribulations and desperate circumstances that befall him, including the inadvertent escape and loss of a friend's orange tabby cat, whom Llewyn feverishly tries to find and return. A silver lining just may exist in the form of Chicago recording impresario and producer Ben Grossman (played by F. Murray Abraham), to whom Llewyn makes a pilgrimage, with the hopes that his bad luck will finally pay off, potentially leading to future good fortunes. Joel and Ethan Coen's "Inside Llewyn Davis" is a frigidly atmospheric experience that is decidedly not a film about a plot but definitely a character portrait housed inside a work of rich texture encased a very black mood. It is a wintry film, bitterly so, that unfolds as an escalating series of painfully unfortunate events in the life of a very talented yet insufferably self-important and misanthropic protagonist. In many ways, "Inside Llewyn Davis" works as a companion piece to several previous Coen brothers' films like their homage to film noir "The Man Who Wasn't There" (2001), the grim slapstick of "Burn After Reading" (2008), and the intensely inscrutable "A Serious Man" (2009) as all of those films feature hapless characters trapped within Kafka-esque worlds, sometimes of their own design, sometimes not, yet completely enveloping and with no hopes of relief or escape. Such is the state of being of Llewyn Davis as he is equal parts a victim of circumstance as well as the hard driving engine of his own deep misery, a duality that creates a similar reaction for the audience: You do wish him well and to finally achieve the success that he is chasing to an almost despairing degree but you also know that he is also not the person that you would want to spend much time with so as to not get sucked into his personal black hole. The film illustrates the Coen brothers' specialized brand of nihilism once again as "Inside Llewyn Davis" concocts a dark, angry world where just having talent is not enough for survival and artistic vindication. Disappointment is paramount and life is filled with all manner of recrimination, desperation, and intense failure and it is to their great credit as writers that they never have the material come off as pretentious, only ensuring the work's wise yet gloomy portentiousness. Additionally, the Coens have only continued to somehow discover new ways to making events feel so random and meaningless yet with their writing and storytelling, the events are so meticulously devised and entirely purposeful and meaningful. If one element was just this far out of place, the entire film would fall like the proverbial house of cards...like the state of Llewyn Davis's life. Strangely, and as nihilistic as the Coen brothers' work tends to be at times, there is indeed a sense of greater empathy at work near the core of "Inside Llewyn Davis" as we can see how the suicide of Llewyn's former singing partner has unraveled not only his life but seemingly the fabric of the connective tissue that bound their particular circle of performers and friends together. It is as if the Coens have devised a story that shows how inter-connected we truly are and how one life can indeed make all of the difference in providing a certain inexplicable balance, a balance that evaporated once that life had been extinguished. Llewyn Davis is increasingly undone throughout the film as he occasionally and mournfully listens to the one album he recorded with his partner, a ghost that follows him in seemingly every exchange he has, reminding him of the magic they created together and how that magic is missing as he performs alone. No matter how gifted a musician he actually is--and as portrayed by Oscar Isaac, who does perform his own terrific singing throughout the film, he is a gifted musician--perhaps his former partner made him even better and maybe Llewyn Davis will never be as good as a solo artist as he was in a singing duo, a possibility that elicits an unending sting. As directors, the Coen brothers are filmmakers who achieve what increasingly few filmmakers are able to do by creating their own film universe. As with their writing, not one element is out of place, no matter what their subject matter happens to be or which genre they may be tackling. "Inside Llewyn Davis" is no exception as the film's visual and production design is absolutely sumptuous. It is as if their film's entire visual aesthetic is based upon the merging of two classic album covers: Bob Dylan's "The Freewheelin' Bob Dylan" (released May 27, 1963) and especially, "Inside Dave Van Ronk" (released October 1964) by Dave Van Ronk, the artist upon whom Llewyn Davis is loosely based. Most surprisingly, for a film world whose visual sheen is this gray and almost bleached out, the Coens, working in collaboration with Cinematographer Bruno Delbonnel, make "Inside Llewyn Davis" look positively lush. All of the film's performances are as top-tier as you would expect from any film by Joel and Ethan Coen, with especially Oscar Isaac's naturalistic presence, singing and acting, still resonating deeply days after having seen the film. His self-absorption as Llewyn Davis reminded me a bit of the doomed playwright turned B-movie screenwriter in "Barton Fink" (1991) as both of those characters possess self-righteous and even self-destructive tendencies entirely based within their impenetrable stances on what they think artists should and should not be. But his shaggy dog appearance, as well as his tendencies to be polite, apologetic, regretful and truly worried about the fate of that aforementioned lost orange tabby cat who keeps re-appearing only to to disappear again to Llewyn's torment, made me think of and compare him to the genteel hero of "A Serious Man" whose life completely falls apart through no fault of his own. 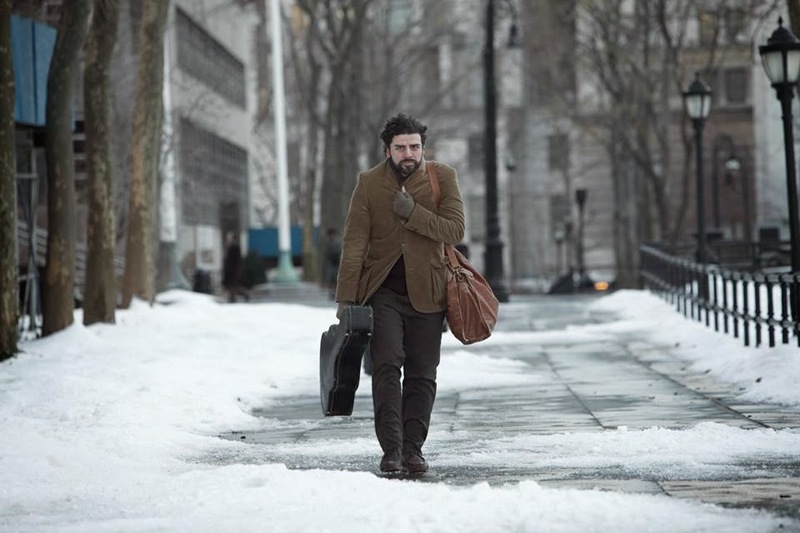 Isaac makes Llewyn Davis a character you do want to take in from the cold for the night even though you may wish to strangle him the very next morning. Justin Timberlake impresses onscreen once again by seamlessly immersing himself into the Coens vision and the film's time period with ease. John Goodman, who appears as a sardonic jazz musician, always enlivens a Coen brothers' feature and Carey Mulligan delivers an unprecedented forceful wrath that always made me snap to attention. And I thought that the addition of F. Murray Abraham was an excellent and extremely clever bit of casting! To think, the once embittered Sallieri, the composer who could never grasp the keys to the musical kingdom in Milos Forman's "Amadeus" (1984) now sits as the man with the keys who may or may not allow Llewyn Davis entrance into the musical kingdom...well played, Joel and Ethan. Very well played. I would think the impression some of you may have towards folk music is that it is a genre that is polite, quaint, safe, sometimes saccharine and cloying, and I guess to a degree, I hold those prejudices myself. With "Inside Llewyn Davis," those (and my) perceptions were shaken over and again as I was struck by the juxtapositions of the delicate and seemingly angelic music, especially those songs performed by Llewyn Davis with his soaring, empathetic voice and precise finger pickings (like some of Joni Mitchell's best music, you can almost hear music within the spaces between the notes), merged that with the cold, coarse ugliness of the film's harsh environment. The Coen have presented a world filled with hurled profanities that are just this shy of "The Big Lebowski" (1998) and populated with junkie jazz musicians, non-communicative beat poets, and an assortment of characters lost within their respective states of dilapidation and seething rage. And then, there are the songs themselves which, as you listen to the lyrics, are nothing more than a collection of various tales of woe, weariness, and defeat. The film opens with Llewyn performing "Hang Me, Oh Hang Me," and continues with the characters of Jim and Jean performing the lament "Five Hundred Miles." A Clancy Brothers inspired singing group handles the mournful ballad "The Shoals Of Herring," and Llewyn returns with "The Death Of Queen Jane." Even the jaunty novelty tune "Please Mr. Kennedy," houses a terrified plea from a most reluctant astronaut. Just listening to the actual lyrics of the songs within the film made me realize that maybe this film is not really presenting a series of juxtapositions at all. Perhaps "Inside Llewyn Davis" is a representation of folk music. And then, I had a realization that hit me near the conclusion of the film and definitely on my way home from the movie theater. Without producing spoilers, lets just say that the narrative of "Inside Llewyn Davis" eventually double ends upon itself, thus creating an experience that is undeniably cyclical. In doing so, what I think the Coen brothers have done is that they have used the language of cinema to essentially create a folk album!! From a storytelling standpoint as well as a thematic point, I think the odyssey of Llewyn Davis, with its motifs, recurring themes and images (like that cat), is made to exist as a record album, a circular and unending cycle of misery that plays onwards from front to back to front in endless revolution, thus signifying the path Llewyn's life is destined to take, with each failure representing a particular set of lyrics or full song. Once that idea or realization took hold, my admiration for the film solidified and skyrocketed, making it an experience I am anxious to see and immerse myself in again and again. Sticking with the circular theme, Joel and Ethan Coen are truly on a creative roll with this film following the extremely impressive run of excellence which has included the Oscar winning "No Country For Old Men" (2007), the crowd pleasing Western remake of "True Grit" (2010), plus the aforementioned "Burn After Reading" and "A Serious Man" and "Inside Llewyn Davis" continues their amazing streak. Now having seen the film, I am now more confused than ever why the Academy Awards barely recognized it at all as I could easily see it deservedly nominated for Best Picture, Screenplay and Directing. But maybe, it is just considering this is a film about the angst of disappointment and failure. And what a brilliant film it is. And they're off once again!!! Dear readers, while many of you may find yourselves salivating over the latest sports draft picks, I, your friendly neighborhood film enthusiast, always finds himself salivating over the annual nominations for the Academy Awards! Even after all of these years, and combined with the knowledge of how political and just downright silly these proceedings actually happen to be, I cannot help myself but to get swept away with the grandeur, the spectacle and most importantly, an event, when at its best, is a celebration of the art and artistry of the movies. All of that being said, I do have to say that my initial reaction to the nominations was more muted, and at times incredulous to a highly negative degree more than actually ever feeling elated. While I am not 100% certain, it seemed as if David O. Russell's "American Hustle," a film I felt to be an enormously sloppy, severely underwritten, poorly directed, ill conceived and purposeless disaster, conned its way into the hearts of the academy by being the clear victor, as far as nominations are concerned. Somehow this film found itself nominated for Best Director, Best Screenplay, Best Editing (what?!?! ), Best Supporting Actor for Bradley Cooper, Best Supporting Actress for Jennifer Lawrence, Best Actress for Amy Adams, Best Actor for Christian Bale and for the love of Pete...Best Picture as well?!?!?! To the full breadth of the Academy of Motion Picture Arts and Sciences, you have been seriously conned to think that what you witnessed upon the silver screen with "American Hustle" is award worthy to this degree, which makes me unable to help but think that the politics of the proceedings have taken center stage for this year and depressingly so. How else but to explain that Meryl Streep was nominated once again for her work in "August: Osage County," a film that has not been terribly critically acclaimed and has actually been criticized for watering down what is otherwise an excellent stage play. Streep's almost annual inclusion in the Best Actress category shows exactly just how far being Hollywood royalty will take you...accolades and coronations solely for showing up, the overall quality of the work be damned. Which is shameful as this year had several other leading female performances that could have easily taken Streep's place. I am thinking of Julie Delpy's work in "Before Midnight." Or Julia Louis-Dreyfuss' warm, rich and layered work in "Enough Said." Or how about Oprah Winfrey's terrific and completely naturalistic work in "The Butler" (more on that film in a bit)? And the hell with whatever the regulations are, Scarlett Johansson delivered one of the finest performances of the entire year as the voice of the computer operating system in Spike Jonze's "Her." Any one of those women would have been a more welcome sight than the overly predictable and just plain tired sight of Streep's recognition one more blasted time. Returning to "The Butler," I was stunned to see it completely shut out of the nominations, especially as the film was a box office smash, did receive some critical acclaim and boasted an unflinchingly astounding performance from Forest Whitaker in the leading role. Now, there did happen to be a variety of critics who complained during the film's initial release that it was nothing more than "Oscar bait," a derisive complaint I felt to be more than a little unfair. But, the entire dismissal of "The Butler" from the running almost felt to be made out of spite or some needless desire to prove to critics that the Academy would to be so easily swayed (but again, please do explain the lavish love for "American Hustle"), or more disturbingly, was it through some sense of racial shortsightedness. Now, I am no conspiracy theorist but I do find it terribly saddening that in a cinematic year that housed "The Butler," "12 Years A Slave" and "Fruitvale Station," a year that potentially could have seen up to three Black males (Forest Whitaker, Chiwetel Ejiofor and Michael B. Jordan) up in the running for Best Actor, we are only allowed to have one. Were there any nominations I was happy to see? Well, of course. Having "Her" nominated for Best Picture, Best Original Screenplay and even for Best Film Score was very pleasing to me as was Jonah Hill's inclusion in the Best Supporting Actor category for his explosive turn in "The Wolf On Wall Street." I was thrilled that "Before Midnight" was represented at all in the Best Adapted Screenplay category. And well...frankly, not much else as it all seemed to be as predictable and as unimaginative as many of the films released in 2013. As for the Best Picture nominees, out of the nine films, I have only seen six as "Dallas Buyer's Club" arrived and exited my city fairly quickly, I have had no interest whatsoever in "Philomena" and as for "Captain Phillips," I just hate Director Paul Greengrass' over-utilization of the dreaded "shaky-cam" so tremendously that I will wait to see that one on DVD. Even so, and while I am happy that four of my top five favorite films of 2013 are represented, I wish that I could wrestle "American Hustle" out of that bunch as I could think of perhaps fifteen other films I saw in 2013 that would be enormously more deserving of recognition than that piece of incoherent..."Oscar bait." But, let's see what transpires on Sunday, March 2nd and hope that the real cinematic heroes of 2013 prove to be victorious. ALL THE LONELY PEOPLE: a review of "Her"
Let's just get this whole thing started with the proverbial "bang"! If not for Director Steve McQueen's searing "12 Years A Slave," Writer/Director Spike Jonze's "Her" would be my number one favorite film of 2013 hands down. But hey, number two is still an outstanding place to rest so comfortably for a film that is this deeply conceived, executed and felt. With only four feature films to his credit, Spike Jonze is precisely the artistic shot in the arm that 21st century cinema so desperately needs right now as his creative output is uniformly top tier. With "Being John Malkovich" (1999) and "Adaptation" (2002), his collaborations with Writer Charlie Kaufman, Jonze presented two dizzying and deliriously inventive films the very kind of which have not, and probably could not, be duplicated. Even better was his stunning, game-changing 2009 adaptation of Maurice Sendak's Where The Wild Things Are, in which Jonze gave us an extraordinary and deeply autumnal exploration into a child's emotional landscape that was as visually thrilling as it was so beautifully perceptive. Now, with the arrival of "Her," Spike Jonze has unleashed what I am reading is possibly his most personal film but is definitely his finest film to date and I truly hope that I am able to fully explain to you how transformative of a film experience seeing this film was for me. "Her" is, and fully represents, the very kind of film that that would typically end up as being one of my favorite films of any year as it is a film that fully transcends its subject matter and primary conceit to becoming a film that is not solely about its characters and main storyline but is also a film about all of us sitting in the movie theater, all of us that co-exist in the world at this point in time. Yes, by now, I m certain that you may have heard the basic idea of the film-a man falls in love with his computer--but trust me, "Her" probes decidedly and profoundly deeper, unearthing a well spring of emotion that felt grueling, exhausting and by the film's end, the real world did indeed look a little different as my perceptions had been altered that powerfully. The theme of "humanity" will forever remain an important characteristic to seek within the movies I see in my life and Spike Jonze's "Her" is as impassioned plea for humanity as I have ever seen. Set in an undetermined future Los Angeles society, "Her" stars Joaquin Phoenix, in yet another outstanding performance, as Theodore Twombley, a lonely, introverted man who lives alone and in a perpetual state of melancholy due to his impending divorce from his childhood sweetheart Catherine (Rooney Mara). Theodore earns his living working for a letter writing company, composing intimate letters for customers who find it impossible to fully express their feelings themselves. One day, and mostly on a whim to combat his seemingly endless depression, Theodore purchases a new computer operating system which is stored with an artificial intelligence that possesses the ability to speak and evolve like a human being. After deciding to give this new operating system a female identity, "Samantha," (richly and beautifully voiced by Scarlett Johansson) as she names herself, is born and the twosome form an instant connection. Over time, their relationship develops into a passionate love affair that awakens Theodore from his gloom, Samantha into an increasingly higher consciousness and propels both beings into an emotional odyssey into the deepest natures of love and interpersonal connection. "Her" is the kind of film that may remind you of some films from the past but somehow Spike Jonze has realized a vision that is unlike anything I have quite seen before. Yes, there are dashes of Stanley Kubrick's "2001: A Space Odyssey" (1968) here, Ridley Scott's "Blade Runner" (1982) there and even some sprinkles of Steve Barron's "Electric Dreams" (1984), that music themed romantic comedy which told the story of a computer who falls in love with a human. But even moreso, "Her" exists very closely in the same film universe as movies like Kevin Smith's "Chasing Amy" (1997), Michel Gndry's "Eternal Sunshine Of The Spotless Mind" (2004) and Jonathan Dayton and Valerie Faris' stunning and sadly underseen "Ruby Sparks" (2012), movies that dare to explore the nature of love at its messiest, most confusing, confounding, turbulent, hard fought and agonizing. "Her" is a tone poem to emotional alienation, isolation and the difficulties of finding and maintaining new interpersonal connections, and therefore, it is a film that I often found to be very painful to sit through, at moments, even depressing (more on that later). But Spike Jonze's vision was so explicitly real that the film felt as if it was deeply conceived from the inside out, as if Jonze laid all of his nerve endings completely bare for us to view, experience and share what he may be perceiving the nature of love to be. As I stated earlier, "Her" seems to be Spike Jonze's most personal film to date. In fact, I felt that it could almost be a companion film to Writer/Director Sofia Coppola's "Lost In Translation" (2003) of all films as Jonze and Coppola were once married to each other and the filmmaker character Giovanni Ribisi portrayed, the very one who is constantly leaving his lonely wife (played by Scarlett Johansson) behind, alone and adrift in Tokyo, in Coppola's film was rumored to be based on Spike Jonze! This piece of information made me feel that through Theodore Twombley's pain, we were possibly viewing Jonze's side of his unique love story, or at least the emotional aftermath of their divorce which features his sincere, earnest confessionals as to how he may have failed. "Her" seems to be asking at points, why are the words "I love you," the three greatest words in our language, so often the most difficult words to say to each other. That fear of rejection, that fear of being misunderstood, that fear of enduring even one more instance of paralyzing emotional pain, the kind that may make us desire to retreat from any human contact lies at the very bruised and damaged heart of "Her." Within the story of Theodore, Jonze holds up a discomforting mirror to all of us as well as the film exists also as a cultural critique about our increasingly dependent relationship with technology, a relationship that continues to advance seemingly at the expense of the very traits that bind us together as human beings. .
"Her" takes place in the future, an unnamed time but visually resembles something shiny and excessively clean like "The Jetsons" but without the flying cars and robot maids. But, Jonze's future vision is clean to the point of anti-septic, and is one that belies a societal emotional wasteland filled with disconnection and emotional instability. In the film, our relationship with technology is such that people are unable to compose their own thoughts without outside aid from a faceless corporation. Jonze shows us a highly populated society in which everyone walks around with ear buds firmly in place, and heads faced downwards gazing at the computerized devices in their hands. At the opening of the film, we see Theodore and the people that surround him on the sidewalks and transportation systems, only acknowledging their devices as the computers speak to their respective users, scrolling through e-mails, and even selecting the proper music to fit the individual's moods for the day. While people are constantly talking, the speech is rarely projected towards another human, but only to the machine who sits without judgement, and only exists to serve and please. Sounds a little uncomfortably like right now in 2014 doesn't it? The arrival of the new operating system, in which Samantha and others like her have been formulated, presents the next "evolutionary" step as Theodore, so overcome with mournfulness and romantic despair that reaching out towards, and even being seduced by that pleasant, frisky, helpful, understanding, non-judgmental voice inside the machine seems to be the easiest connection to make. Or is it? "Her" very perceptively delves into the mystical power of the voice and how through only hearing a speaking voice, we are all seduced and ultimately conjure up fantasies of what the actual person who possesses the voice in question may be like if only we were to meet them face to face. To that end, with whom is Theodore falling in love with. The entity Samantha actually happens to be or a mere projection of his deepest wishes being projected back to him in that voice? Furthermore, we also know that Samantha is a digital creation, something that is indeed not human or in some respects, even real. But, Samantha's sense of consciousness continues to build and grow through her relationship with Theodore, thus blurring the lines of what is perceived to be real, especially in regards to what they are each feeling. With that, "Her" deftly explores the levels of reality, perceptions of said reality as well as our intense projections, the kinds of which that can make relationships fail between humans and Jonze illustrates how it is even more precarious between humans and machines, escalating his story and future vision to surprising territories, to uncomfortable situations that I had not forseen, uncovering emotions I did not expect to feel. What is indeed our relationship with technology in 2014? Our smart phones, social networks and all? Is our world truly growing smaller because with a click of a button, we can connect across the world no matter where we are or are we growing increasingly disconnected as we are all riveted to our screens and the immediate, non-judgmental responses we receive from our varying technological systems? Like David Fincher's "The Social Network" (2010), Spike Jonze poses disturbing questions as his film also serves as a societal warning to our collective narcissism and our potential cultural solipsism. "Her" is presented through a sumptuous visual and production design that firmly establishes its unique time, place and emotional landscape. The music score, composed and performed by Arcade Fire, also lends considerable weight and sorrow to the entire experience. And all of the film's performances of some of the finest the film year of 2013 has had to offer. Joaquin Phoenix, fresh from his explosively maddening turn in Paul Thomas Anderson's "The Master" (2012), has reconfigured his entire state of being once again in a performance that feels married to the words of Spike Jonze's original screenplay as his portrayal of Theodore is so emotionally convincing and recognizable that I do believe that if any of us have ever had our hearts broken (or even several times), the choices he makes are so sadly and compassionately understandable. Not terribly long ago, I ventured into a neighborhood coffee shop for a latte and was taken aback from the sight I witnessed. This was a coffee shop that I have frequented for many years and it is a place that is typically filled with hearty conversations, laughter, and the clinking of glasses existing comfortably alongside those writing in their journals or doing homework on their laptops. But on this particular day, the coffee shop was utterly silent, aside from the music on the speakers and the noise from the coffee machines. Yet, the coffee shop was not empty. On the contrary, it was completely filled, with every table occupied but not one person was speaking to another human being on this particular day. Everyone was enveloped into their cell phones, laptops and headphones and it was so very odd, and more than little sad, to see a place of community transformed into one where every person was isolated in the worlds of their own makings. That is the world Spike Jonze presents to us in "Her," a film about our relationship with technology that is urging us to not forget the characteristics that make us human beings, even when we are crippled with emotional pain. It is a romantic film true. But it is a brutally honest film that is also sharply satirical, erotically charged and I would like to think somewhat hopeful that our interpersonal connections cannot be deleted from our existence. Spike Jonze's "Her" sits near the very top of my favorite films of 2013. PETER JACKSON'S SELF PORTRAIT: a review of "The Hobbit: The Desolation Of Smaug"
In my latest batch of reviews for the films "Nebraska," The Secret Life Of Walter Mitty," "The Wolf Of Wall Street" and "American Hustle," I wrote repeatedly about the concept of purposefulness, essentially the core of the work that not only drives the film, but also the core of the wok that drove the filmmaker to even pursue this undertaking in the first place. With the arrival of "The Hobbit: The Desolation Of Smaug," Director Peter Jackson's second installment in his prequel Middle Earth trilogy, I find myself returning to this theme in earnest. Yes, the film is as visually resplendent as anything that you may have even grown to expect from a Peter Jackson adaptation of a J.R.R. Tolkien work of literature. But unlike his majestic "Lord Of The Rings" (2001/2002/2003) film trilogy, this new film is as emotionally empty as a hollow bark of the tallest mythical tree. Yes, dear readers, I did give a high rating to the first installment, last year's "The Hobbit: An Unexpected Journey," but I was also quite critical of not only that film's dead-in-the-water middle hour but I also seriously questioned the sheer purpose of making a full trilogy from one book. I worried if what we would be receiving would be a sense of overkill, perhaps Peter Jackson was being a bit too reverential to the source material of the original novel and extended appendices. But this time, around, it just became clear to me that reverence may not the issue. For all practical purposes, "The Hobbit: The Desolation Of Smaug" is more of a roller coaster than the first film, I guess. But to what end? Was any of it at all necessary? What was the purpose? I am afraid that this time, Peter Jackson has forsaken passion for the art for the lure of cold, hard cash and the last thing Middle Earth ever needs to be is cynical and so underwhelming. "The Hobbit: The Desolation Of Smaug" begins in breathless mid-stream as the titular Hobbit, Bilbo Baggins (Martin Freeman), the wizard Gandalf (Ian McKellan) and thirteen dwarves led by Thornin Oakenshield (Richard Armitage) are continuing their quest to the Lonely Mountain to reclaim their stolen fortune and homeland from the fearsome dragon Smaug (voiced by Benedict Cumberbatch) while also being feverishly pursued by an army of vengeful Orcs led by Azog the Defiler (Manu Bennett). Throughout all of this, plus the arrival of the warrior elves Legolas and Tauriel (Evangeline Lilly) who aid the heroes in their battle with the spiders (which I will admit that I watched through my fingers that shielded my eyes), covers perhaps about the first 30 minutes or so of the film. What is most unfortunate is that there is about another 2 hours and 15 minutes remaining and the film buckles under its own weight as we are subjected to one battle sequence, daring escape and CGI frenzy after another and another that I found myself growing bored and saddened that now even Peter Jackson, a filmmaker who has performed so much better and definitely knows better, has delivered one more movie that is the same as most movies that arrive in our theaters these days: the soulless behemoth that for all of its considerable sound and fury, signifies absolutely nothing. Let's face it..."The Hobbit: The Desolation Of Smaug" is a film without a plot, and therefore, it is a film without any sense of real purpose. It is an an installment that does not deepen, broaden or build upon what we have seen in the first installment. It is really just a sequence of traps and escapes, while executed with the same visual dynamism that has now become Peter Jackson's trademark, it all felt so empty this time around. And again, the film also felt to be more than a little cynical, as if Jackson knew that there was not really any story to tell so if he just filled the nearly three hours with all manner of superfluous material, from action sequences to full characters, perhaps we would be fooled that we were seeing something thrilling and epic. It's really an awful concept to suggest, especially because we all know how very much Peter Jackson loves the world Tolkein created. But I really believe, even moreso than I did with the previous film, that there is absolutely, positively, unquestionably no need whatsoever to have turned this one book into a new trilogy when he could have utilized his massive artistic talents and made a great, tight and taut three to three and a half hour singular film instead. But why make one movie when you can make three movies that you know that absolutely everyone will see? Why make money on one when you can do it three times over? I really think that commerce won the battle this time out and that feeling is tremendously disappointing to me. Now before you all think that I am perhaps being too harsh or if I am taking this either too seriously or even to an unnecessary place, just think for a moment about what is indeed upon the screen. As with the appearance of Cate Blanchett in the first film, move which I felt to be a shameless and needless nod to "The Lord Of The Rings" films, please tell me why is Legolas, who, if memory serves me correctly, does not even appear in the novel, in this film at all other than to just have Orlando Bloom back in action? Furthermore, why is Evangeline Lilly in this film as well? While she gives a fine performance, the character of Tauriel is a Peter Jackson creation and her inclusion in this story is not plot driven in the least and only seems to (again) shamelessly inject some estrogen into the male-driven proceedings as well as have a poorly manufactured love triangle between herself, Legolas and the dwarf Kili (Aiden Turner), clearly an echo of "The Lord Of The Rings" love triangle of Aragorn (Viggo Mortensen), Arwen (Liv Tyler) and Eowyn (Miranda Otto). And really, even with two films, can you still tell all of the dwarves apart, do you even know all of their names and honestly, do you even care? The two films this far, have had more than enough scenes of the dwarves running around in a panic and they have grown to be so tiresome, no matter how well they are presented. This film, in particular, features a breathless chase down the rapids as the dwarves are all encased in barrels with Orcs as well as Legolas and Tauriel in pursuit. And yet, what was the purpose? Did the story move any further than it did at the opening of the film? Nope! It was just so underwhelming and just so sad considering all of the considerable effort that was placed into the pacing and special effects that should have otherwise been placed into the actual storytelling. Why, even moreso, is so much time being spent upon constructing the conflict of "The Lord Of The Rings" in a film series that is entitled "The Hobbit," and claims to actually be about this figure? This massive mistake, not only saddles the films with too much padding, we essentially have a film series in which the titular character is sidelined in his own story over and over and over again. 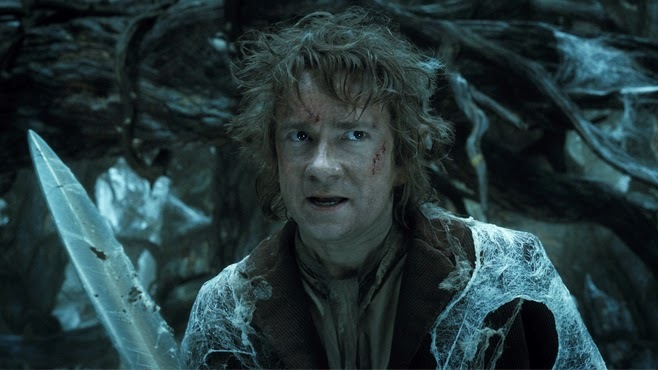 There is considerable screen time in which Bilbo Baggins is not even present let alone a key player in other sequences where he is often shuffled to the background. And what a shame as Martin Freeman is again showing that he is more than up to the task of becoming a major figure in Peter Jackson's film universe. Freeman has the air of a light comedian combined with the skill of a a fine dramatic actor as he has so effectively displayed the shadings of an innocent slowly becoming increasingly corrupted and increasingly fearful with the discovery of the darker sides of his otherwise kindly and amiable personality. The best scenes of the series so far have easily been his riddles in the dark with Gollum (Andy Serkis) from the first film and the first stretches of his extended sequence with the greedy and gigantic Smaug but those scenes are in terribly short supply and again robs the series of its purpose. Dear readers, I stumbled upon a theory while watching "The Hobbit: The Desolation Of Smaug" that I wish to share with you. My distaste with this film arrives from the idea that all of Peter Jackson's previous films were ones made purely from the soul and the purity of his art. That with his film trilogy of "The Lord Of The Rings," we were given three films so astoundingly tremendous because we were in the hands of a director who was making films because he HAD TO MAKE THEM and in my opinion, "The Lord Of The Rings" film trilogy were a series of movies so passionately created that they all felt as if we were seeing the last films Peter Jackson would ever have the chance to make. Now...I think that same spirit continued with his remake of "King Kong" (2005) and his much maligned adaptation of "The Lovely Bones" (2009), a strange, disturbing film that did weave a dark spell over me and I found myself entranced by. Of course, having Peter Jackson direct a film version of The Hobbit was certainly inevitable but after the critical and box office failure of "The Lovely Bones," I am wondering if Jackson felt the need to improve and revive his Hollywood cache by returning to a sure thing. No one can question Jackson's passion for Tolkien but I am feeling that with "The Hobbit" film series, he is not making films because he just HAS TO. He is making these films just because he can. And while I would hate to think of him as being purposefully greedy, Peter Jackson definitely is smart and savvy enough to know that a massive fortune will arrive as a result of this new series no matter how good or bad they actually are. I do think that it is more than telling that Peter Jackson has expressed in interviews that once this trilogy is completed, he desires to leave massive budgeted films and extravaganzas behind and will then make smaller, more personal films once again. With that bit of key information, "The Hobbit: The Desolation Of Smaug" may have actually shown that its purpose may not be entirely lucrative but also one that just may serve as a self portrait of sorts. Because with these films and Peter Jackson himself, at this particular stage of his career, what do we have but an actual metaphorical representation of Smaug himself: lazy, bloated, surrounded and engulfed by more riches than he would ever know what to do with. That is not a fate deserving of a Hobbit or of a filmmaker of the skill, talents and artistry of Peter Jackson. But we have one more film to go this coming December and what arrives after that...well, that's the real cliffhanger. And now, I could not be any more excited and proud to invite you to the fifth year of Savage Cinema, which is happening on this first day of the new year and right before your eyes!! While new 2014 film releases for January tend to be nothing more than cinema's boneyard. most thankfully there are more than enough 2013 films that, either, have yet to see their major releases or there are still films that I have to catch up to before I begin my four part annual Savage Scorecard series. 1. "The Hobbit: The Desolation Of Smaug," is still waiting to be screened and hopefully, I will bebale to get to that one this coming weekend. 2. Spike Jonze's "Her," has been one of the films that I have been most anxious to see since possibly late last summer so once that film arrives in my city (hopefully around January 10th), I'll be able to get to that one. 3. And then, there "Inside Llewyn Davis," the latest experience from Joel and Ethan Coen, and there's no stopping me from seeing that film of course. 4. And finally, there's "Labor Day," starring the glorious Kate Winslet and the always compelling Josh Brolin and written and directed by Jason Reitman, whose varied and challenging filmography is the only reason I need to see this film at all. I think these are somewhat conservative goals for the month but we'll see if I am able to squeak in another feature or not. But, as always, I must pace myself in order to not only ensure quality control but to also ensure that I do not burn out in the first month of the year!! ...I'll see you when the house lights go down.